Here’s the latest interview I gave to SW Spring Valley View. Next, the launch of my website will hopefully happen next week. Still working on technical problems. It’s not easy to transfer a wordpress blog to a self-hosted wordpress website. Many of the widgets that work on my blog require coding tweaks to work on a website. Very frustrating! But perseverance is my middle name so onward and upward. 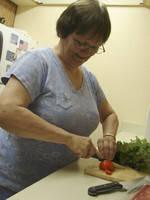 JoAnn Jagroop whips up a quick snack made of tomatoes and goat cheese wrapped in prosciutto and red leaf lettuce while in her Spring Valley kitchen. Jagroop writes a blog on her Web site This Dame Cooks Blog, thisdamecooks.wordpress.com, where she passes on some of the recipes she has created throughout her career. Unemployment may be at its peak in Nevada at 10.4 percent, but that does not mean it’s time to throw in the towel, according to JoAnn Jagroop. “It is time to get creative,” she said. Jagroop moved to Spring Valley in December after she was laid off from her job as an accountant in Colorado. The 61-year-old branched out from her dual chef and accounting background to apply for any job opening she could find. After three months without work, Jagroop began to think outside of the corporate box. She had worked in kitchens in several different countries including New Zealand and the Kingdom of Tonga in the South Pacific, so she thought, why not write about her adventures in cooking? Jagroop took a class on how to blog, and in March launched This Dame Cooks Blog – named for her “saucy side,” she said. The blog, thisdamecooks.wordpress.com, tells of the recipes she created as a charter cook on sailboats in the Caribbean, as a restaurateur in the South Pacific islands, a sous chef in New Zealand and a cooking show host in Tonga. Some of Jagroop’s best writing material comes from her time in Tonga when she turned her carport into a commercial kitchen and made homemade yogurt, cheese, chutney and jam. She then opened her own restaurant on the island called Coco’s Deli Cafe, which she operated for 12 years. Grocery stores on the island carried few ingredients, Jagroop said, so she had to, once again, get creative. She settled for cocoa powder instead of chocolate chips and powdered milk instead of cream. Jagroop, who grew up in Washington, said some her earliest memories are with her parents in the kitchen. Both her parents were talented cooks. In less than two months since its inception, This Dame Cooks Blog draws an average of 150 visitors a day. Jagroop’s goal is to draw traffic to the blog and eventually launch her own recipe-heavy Web site where she will sell her books, kitchenware and other products. Barbara Schiffers, a former chef from Washington, said she logs onto This Dame Cooks Blog weekly for new recipe ideas and laughs. As part of her plan to “get creative,” Jagroop is also writing two e-books — “Sorbets with Spirit” and “Polynesian Cooking” — that she plans to publish on ClickBank.com by September. She also is a freelance writer for online magazines Suite101.com and EzineArticles.com. Contact Southeast and Southwest View reporter Danielle Nadler at dnadler@viewnews.com or 224-5524.